There’s something a little nostalgic about outdoor pub signs. Perhaps it’s a sign of the times, when everything has gone digital, from menus online to waiters taking orders on a smart phone, that something as simple as a sign promoting a pub evokes memories of summers gone by. 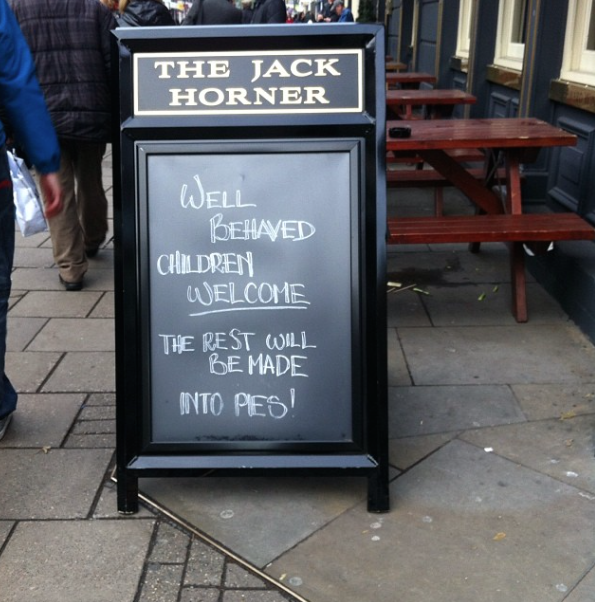 But have you really looked and thought about pub signs? There’s a lot of rich history within most outdoor pub signs and it’s easy to decipher their messages once you’ve taken into account the history behind them. Back in the 12th century, weary travellers of Britain sought accommodation in the many number of monasteries along their journey, but they filled up quickly and the monks couldn’t keep up with the demand for beds. Savvy businessmen capitalised on this fact by setting up private inns with religious images depicted on the signs outside to entice the travellers in and make them believe they were still staying in a religious building. Back then it wasn’t unusual for the majority of the population to be illiterate, so there were generally no letterings or wording and images echoed the familiar stained glass windows of beloved churches. As more and more establishments like this opened, as did the pool of references in which the pub signs were derived from. 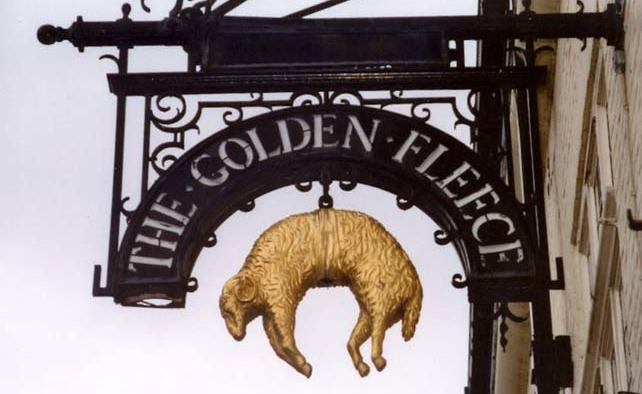 Named after not only religion or religious icons but royalty, town heroes and occasionally scandals were brought into the mix and so was the birth of the pub signs we’ve come to know and love. They were originally made from wood or slate, with the pictures scrawled on with stone, but eventually as the times passed and tools had improved, they were painted onto wood and metal. Nowadays signs are made from steel, cast iron, aluminium, treated wood and even acrylic and hardened plastics. The history and nostalgia is still there with the old pubs, and indeed even with new pubs opening, they are replicating this deep rooted tradition by replicating outdoor pub signs that wouldn’t look a miss back in the olden days! With the rise in nostalgia and a love for all vintage, pubs have often doubled up their signage with retro looking chalkboards advertising their latest wares on the glossy black boards that remind everyone over the age of 25 of their childhood classrooms. With chalkboards, it’s just as easy to inject a little bit of personality into your business, albeit it a flash in the pan message. There’s been a trend for funny, smart and even artistic promotional messages on signs and chalkboards outside businesses of late and it’s really helped to push businesses’ connections with consumers just as much as the outdoor pub signs did back in the 12th century when they were looking for a bed to lay their head on and an ale to quench their thirst! Take a look at our fantastic range of chalkboards to convey your businesses’ message or history.